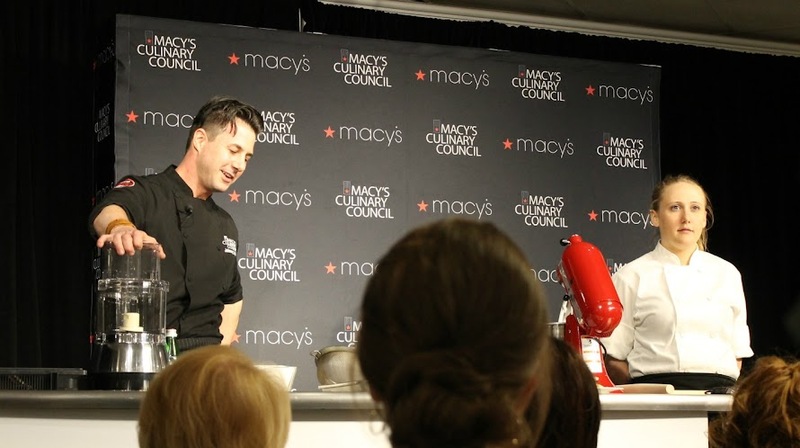 So when I heard that one of the events would be a cooking demo at our local Macy’s, conducted by Johnny Iuzzini, one of their Culinary Council members, I was pretty excited. When I found out that I’d also get a few minutes before the demo to interview him, I was even more excited. I’ve been a fan of Chef Iuzzini’s work for quite a long time and I was interested to see what he would have to say. Chef Iuzzini worked for many years as the Executive Pastry Chef at Restaurant Jean Georges (which was considered one of the world’s fifty greatest restaurants). During that time he was named Pastry Chef of the Year by James Beard Foundation – a big deal, as they only give a single award each year – and has also been recognized as one of the “10 Most Influential Pastry Chefs in America” by Forbes and as one of the “Top Ten Pastry Chefs in America” by Pastry Arts and Design. He was also the head judge of Top Chef Just Desserts, which my husband and I both enjoyed watching. A few years ago Chef Iuzzini retired from Restaurant Jean Georges. I asked him what he had done during that time, and he explained that he spent nearly a year studying gelato. I joked with him about if there was enough to learn about gelato to study for a year, and he surprised me with just how complex the science is. You even need to account for the season, because the sweetness of the fruit will change based on it. He also surprised me with his answer to my question about what kinds of desserts he likes to make for himself when he’s not working. The answer? None! He says he enjoys keeping work and personal life separate; it’s how he manages balance. I followed up with a question on what he likes to cook. He said normally he either eats at friends’ restaurants or orders take out, but when he does stay in at his cabin in the Catskills, he loves to grill up a protein and a half-dozen veggies. Our conversation turned towards his book Dessert FourPlay: Sweet Quartets from a Four-Star Pastry Chef, which he graciously signed for me. It’s a beautiful book full of delicious-sounding recipes that I can’t wait to try. He has another one, Sugar Rush: Master Tips, Techniques, and Recipes for Sweet Baking, which will be available in September. He’s also working on opening a very cool chocolate factory concept, using coffee and locally sourced ingredients. After we finished taking, it was time for the demo. First up were Lime Shortbread cookies. While he showed us how to make them, he dispelled the notion that you should use room temperature butter, and instead says he uses only cold. It was an interesting fact to learn! 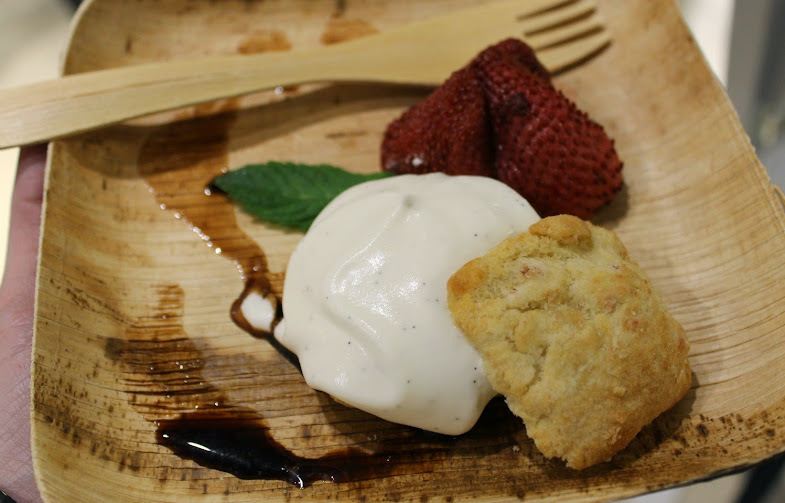 The shortbread was followed by a kind of strawberry shortcake with slow-roasted strawberries, homemade biscuits, and a vanilla crème chantilly. Oh, so delicious! Hubby loves strawberry shortcake, so I’ll definitely be using the recipe they provided to try it out myself. The last recipe we sampled was a Devil’s Food cake topped with chocolate pudding and Soft Cream, then garnished with candied rose petals and cocoa nibs. Chef Iuzzini was so funny and personable through the entire night, even commenting that he chose the candied rose petals so that he could make sure all the lovely ladies in the audience received a rose. If you have the chance, I highly recommend attending a Macy’s Culinary Council event. I know I’m looking forward to the next one! Which of the three desserts made by Chef Johnny Iuzzini would you most like to try yourself?